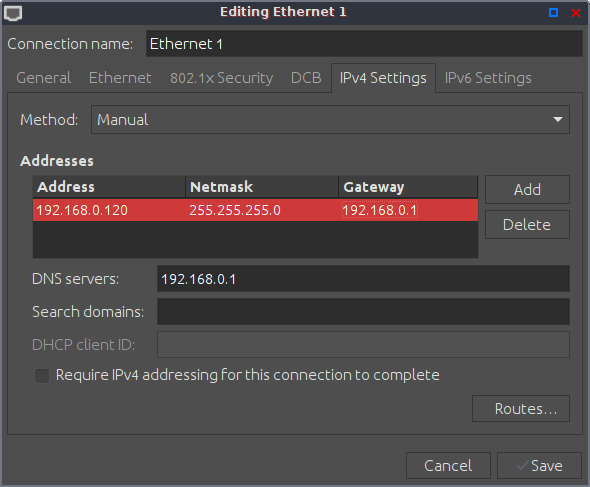 Recently I've been trying to nail down a bottleneck in my network and in doing so tried to set my PC to static IP and for some reason it wont let me, when I try to set the Netmask the input box either disappears or jumps below the line in a weird sort of way however if I just type it in and Tab to Gateway IP it looks like it's set but if I come out of NM or reboot the Netmask reverts back to 24 and the only way to get my network connection back is to set it back to DHCP. Is it a problem? Mine does something similar. 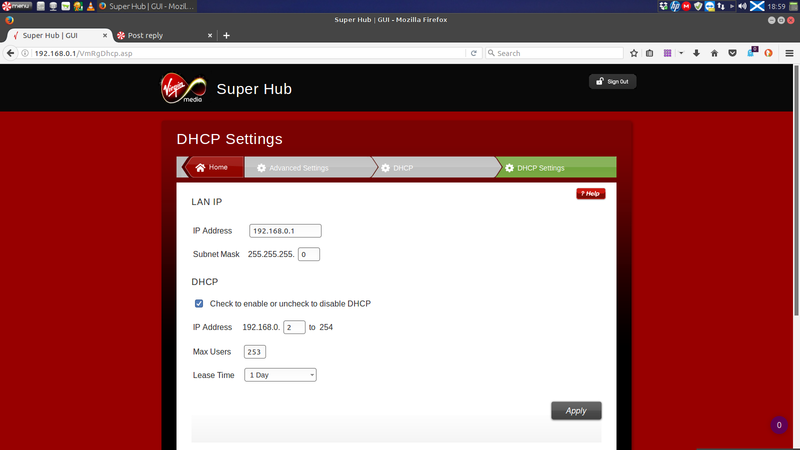 I have DHCP server enabled. But my end IP address is similar to yours --192.168.1.254. Can I ask you are you on wifi or ethernet and have you tried setting a static IP ? As far as I know my IP is considered static --meaning I (with a lot of PCNetSpec's help) never set up a dynamic IP address. I'm using an Ethernet connection, but Wi-Fi works for me too. Nope .. the homeplugs do not dictate your IP address, that's the whole point of a STATIC IP, nothing dictates it. Can't help you with WiCD, but I could probably have helped with networkmanager. You do realise it's perfectly normal for networkmanager to display "24" as the netmask if you entered "255.255.255.0". as it will display "16" if you entered "255.255.0.0"
What's your routers IP ? and what static IP do you want to set for the PC ? Your router probably assigns dynamic IP's from the DHCP pool (the pool of possible IP's you've allowed it to use) starting at 192.168.0.2 and climbing from there. So you will NOT be able to connect to your router with an IP of 192.168.0.10 if that address has already been assigned to another PC (or device) via the routers DHCP server. (ie. if that IP is already in use). Ideally you'd set the DHCP pool in the router to say 192.168.0.2 --> 192.168.0.99 (giving the DHCP server 97 possible addresses to assign dynamically), so it could never automatically assign IP's within the range 192.168.0.100 --> 192.168.0.255 .. then set your static IP's within that range (so dynamic and static IP's can never conflict). But often it's enough to just set the static IP's fairly high in the range, as if you set a static IP to say 192.168.0.110 it's unlikely you'd have 107 devices connected at the same time all getting their IP's dynamically from the DCHP pool.